There is no such thing as easy money. Hedge fund legends are making billions, Warren Buffett is the richest man alive, and to get lambos, lobster, and dollar bills raining from the skies you need to be a master at markets. Trading stocks, crypto, anything from soybeans to crude oil, people everywhere seem to think that this is the way to quick riches. And many will try it. But trading is really hard. There are scammers out there who want your money. There are machines and massive companies who does for a living. Trying to outperform the market is really f’ing hard. But when you’re young and ignorant you don’t think like that. You think you can do and beat anyone at any task you try. I am lucky to say that I’ve never been scammed, and luckily when I was young I never fell for traps like this. Anyone promising insane monthly returns or a stock that was guaranteed to pop was an immediate red flag. I always feel bad for the people that do fall into these traps. Hope and a chance at suitcases of greenbacks is a powerful force. Now that’s something I actually fell for — a chance at a suitcase of greenbacks. Yes, I managed to avoid the scammers. But no, I did not manage to avoid my own ego. I know a lot of you reading have been there. There was a moment early on in your career, when you were just getting started, and you thought the game looked easy. At the time of this post, I am fascinated by the plight of the company that owns part of MoviePass called Helios and Matheson (HMNY), and I keep thinking back to stocks like SunEdison (SUNE). I keep thinking about all people who think there’s a chance at making insane money in these stocks. This can’t be that hard. Everyone is talking about it, and I can’t miss out. One bad play is all it takes. One bad play is when you learn that market speculation isn’t for you. 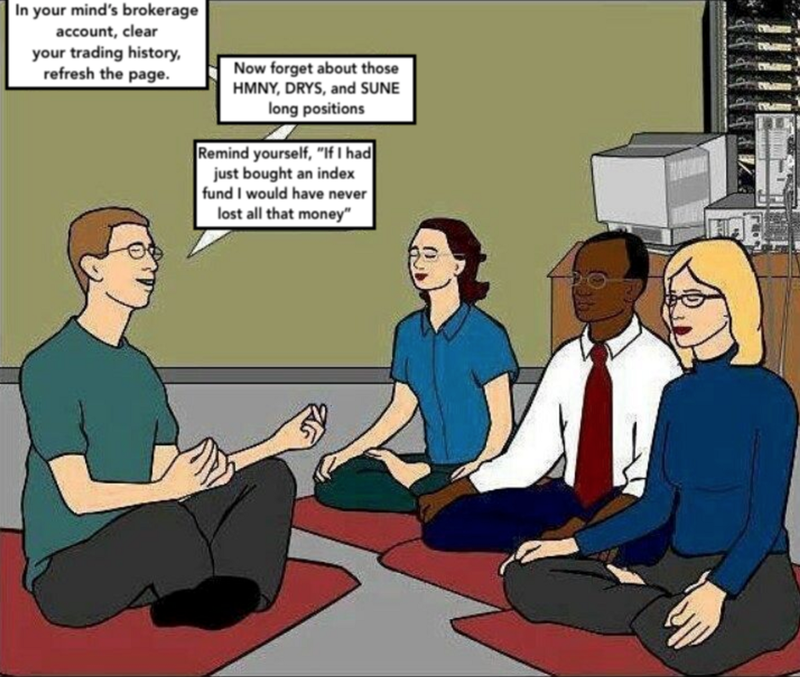 I believe a lot of people are feeling this with Bitcoin today. I think many are also feeling it with the owner of MoviePass HMNY. The feeling gets even worse at the realization of opportunity cost. If you had just bought a mutual fund or an index fund, not only would you still have your money today, you also might have more of it, and you also could have just sat around, potentially never checking the fund once. Opportunity cost is economics 101. When people realize it, their ego goes from that Lion King scene on cliff in subsaharan Africa to McLovin in Superbad. In one scene you are preparing to be the new king of markets and in the other you’re in that awkward high school phase, really with no idea what you’re doing, but at least you tried. Lion King to McLovin. Just like that. Everyone who gets started in markets will most likely ignore this post for now. They’re too good to understand something like this. There’s no controlling the ego beforehand. It must be tested, tried, and broken in actual practice. A post like this will only make sense once you’ve gone through it. Thanks for reading this post. If you enjoyed it, subscribe to my email here and I’ll send you some of my other writings and notes. Make sure you’re also following me on Twitter and StockTwits. The Hardest Lesson About The Stock Market, and Why Most People Become Investors was originally published in Luchini In The Air on Medium, where people are continuing the conversation by highlighting and responding to this story. How Do You Manage 330,000 Employees?